Find My Workspace lists over 95% of the executive office suites market in Brownsville. Simply click Request Quote to check pricing for one office, or Add to Basket for multiple offices. 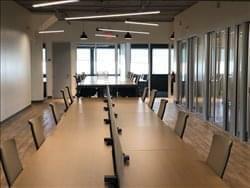 This center is a combination of shared workspace and offices and community for entrepreneurs, established businesses, creatives, startups, small businesses and Fortune 500 companies who need a professional and welcoming office space. The modern designed space has high exposed ceilings with an industrial loft design, floor-to-ceiling windows and an outdoor patio terrace. There is a large lounge area that hosts events for up to 100 guests, a café and kitchen. Plenty of free parking for you and your guests.